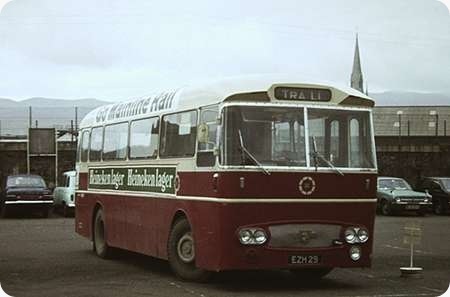 Seen resting in Tralee, this fine looking machine was one of 183 similar vehicles delivered in 1965/66. Mechanically, they sported semi-automatic transmission, air suspension and power steering, and internally fluorescent lighting and forced air ventilation were fitted. Interestingly, they had single curvature windscreens, rather than the BET-style double curvature screens gaining favour elsewhere at the time. That said, the CIE type of screen did lend the Leopards a distinctive air. Presumably in the bus depot yard on John Joe Sheehy Rd. If only we had such interesting vehicles down here today instead of the unremitting diet of Sania/Irizar with a slight dilution of the one and only BMC (no, not them, I mean the Turkish outfit) school bus assigned to Tralee. Yes I think that’s the one Phil, if it’s the yard by the railway station (an ‘interchange?’). I sympathise with you on the lack of variety in Tralee nowadays. It sounds desperate, as my Irish grandparents used to say. Even in the late ‘seventies when the photo was taken, CIE still had quite a lot to offer the enthusiast. They could certainly muster Titan PD3s, Atlantean PDRs, Van Hool-McArdle-bodied Atlantean AN68s, Leopard Ls and PSUs, Bedford SB/MetSec schoolbuses, 12metre Leopard PSU coach and express vehicles with CIE/MetSec bodies, not to mention Leopard / Van Hool coaches, and the odd towing lorry converted from a full-fronted Tiger OPS. All that combined with wonderful scenery, friendly people and the best pints of Guinness in the world. The yard is still there and the bus station building was redeveloped some years ago. "Interchange" is a bit of a misnomer as bus and train departures don’t tie up nowadays. The bus station is busiest on schooldays at around 08.45 and 16.00 when school buses abound – mainly from the CIE service fleet but augmented by private operators. When we moved here from the UK 15 years ago there were a number of Bombardier single deckers, VC class Caetano bodied Volvos – then a couple of years old – even ex Singapore VS class Volvo B57s as school buses. Since then we’ve had some tatty ex West Midland Lynx and a couple of Plaxton bodied VR class Volvos. Double deckers, other than the odd Neoplan tourist coach, are virtual rarities. There used to be a British registered PD3 at the local McDonald’s but that vanished in around 2006, leaving the Bus Eireann Bombardier open top double decker as the only "regular" visitor but even that goes missing in the rare years when Kerry doesn’t win the All Ireland Football Final. Considering the range of vehicles in the fleet, we have very little to look at. It should be noted that this livery layout was unusual on the C class Leopards with the original pointed roof ends (as on this bus) — all except two were all red with just the roof in cream. When the roof ends were altered to a flatter profile several buses had the cream applied down to waist level. Approximately two dozen buses of the 270 strong fleet did not have the roof ends altered. CIE’s E-class buses were based on the 30ft Leopard L2 chassis. As well as being the last CIE single- deckers to sport a roof-mounted luggage rack, they were also the last single-deckers to be designed by the Company. They were certainly rugged-looking buses, which would no doubt have been quite at home on Ireland’s country roads. Early models had ‘single’ headlamps, but these were converted on overhaul to the twin-headlamp layout used on the second batch of buses (E81-170). The modified layout is nicely depicted here on E71, and note the almost obligatory advertisement for Fruitfield Jams. Wonder if it is still available? Thanks for the information Joe. I know what you mean about "who owns what, and where it’s made" these days. It can be more than a bit confusing. If you want to buy a British-built car, it may well have a Japanese name (Honda, Nissan, Toyota). If you buy a Vauxhall, chances are (Astras apart) it will have been manufactured abroad. Ford do not build cars here any longer, but do build engines, and your ‘German’ Volkswagen may actually be Spanish. In the bus world, the American Cummins concern builds engines in Darlington. Optare, once Charles H Roe and part of the old Leyland empire, is now once again under the ‘Leyland’ banner (well, Ashok-Leyland, once an overseas Leyland subsidiary) and Indian-owned. (Talk about going full circle, but hopefully this will provide much needed job security for people). We can probably assume that the new owner will not take the arrogant line with its customers as Leyland did under the watch of that comedian Donald Stokes. We all know what CIE thought of that…..
First type of Irish bus I ever rode on from Shannon Airport to Limerick in August 1963. Passengers’ luggage was put on the roof and then had to be taken down again at the "border post" half a mile from the airport buildings as the terminal was in the Free Trade area and you weren’t officially in Ireland until you passed that point. The DAF DK1160 engine, an 11.6 litre derivative of the Leyland O.680 was employed by CIE when its Atlanteans had consistent mechanical problems and very poor support from BL. As a born and bred Yorkshireman I’ve yet to see Clarendon Yorkshire Toffee for sale in the broad acres. The locally produced toffee is Farrah’s Harrogate Toffee made in Starbeck. I just wonder, as the DAF engine was a development of the O.680, how they could have been so sure, or perhaps DAF just offered better service. To contrast with the view of Atlantean D353 already posted on the website, is this one of of sister vehicle D300. It is seen in the original dark blue and cream livery, which was phased out in favour of the all over sand-coloured scheme in 1974. 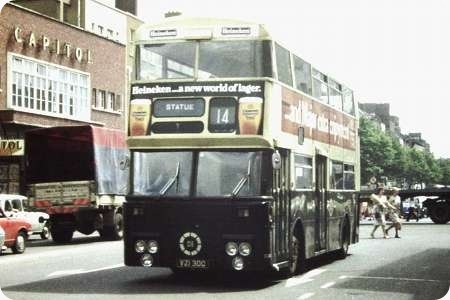 The bus is seen if memory serves correct, in the city of Cork in the late 1970’s. The beautifully quaint destination of ‘Statue’ is wonderful, but then again, the locals will no doubt know which one and where it is….. This vehicle still has the original lower front panel with mouldings around the headlights, and spotlights (compare with the photograph of D353) – anybody know why the modification was subsequently made? 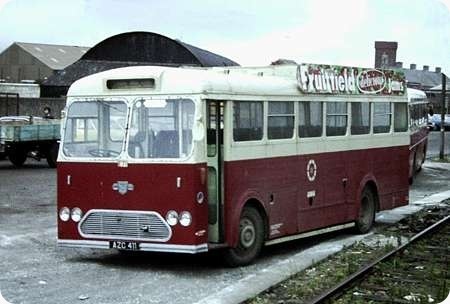 And I remember reading years ago – it must have been in a late 70s/early 80s Buses Annual – that these Atlanteans had "top deck header tanks" . . . to what purpose? As an aside, at the nadir of CIEs’s fortunes between the last Van Hool Atlanteans and the delivery of the first Bombardiers it used to be said that CIE was an acronym for "Cycling Is Easier" – though by the time I had cause to use Iarnrod Eireann/Bus Eireann/Dublin Bus services regularly (early 1990s) things had markedly improved. Anyway, you couldn’t call this an attractive design of body but at least its different, in a "functionally brutal" sort of way – I think it’s got more going for it than, say FRM1 which was 50s half-cab styling dumped on a rear engined chassis, in so far as it pushes design and tries to be different. If I remember correctly the replacement front panels were the result of accident damage and were fabricated in CIE’s own works – and simplicity being the watchword. Yes, Brendan, you’re right, this is Cork. The bus is heading north up Grand Parade towards the landmark "Father Mathew" statue which had been a city terminal point since tramway days. Nice to see this bus in its original blue and cream livery.